Shoe sizes can sometimes differ from brand to brand. The easiest way to determinate your foot size is by printing out our foot measure on A4 paper and following the instructions. With our SHOEPASSION.com size table, you can easily identify the right size for you. I have ordered the wrong shoe size. Can I change this? As long as we have not already sent your pair of shoes, we can still change the shoe size you have ordered. Simply inform our customer service team by e-mail at service@shoepassion.com, so we can change the size as quickly as possible. Why are your shoes so much cheaper than shoes in most stores? As an online company SHOEPASSION.com offers Goodyear-welted footwear at an incomparably fair price. We ensure the most efficient supply chain possible by cooperating directly with shoe manufacturers, a low cost structure and a wide coverage. By cutting out the middleman and no paying for a brand name, we can make sure to pass on savings directly to our customers. Where are your shoes produced? All of our shoes are painstakingly handcrafted in our Spanish shoe manufacture. 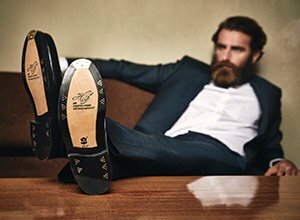 Experienced master craftsmen are used to create just one of our first-class shoes. Just click on the button user account. Here you will find the option to register as a new user. If you already have goods in your shopping cart, just click on the button “checkout“. You will automatically receive an e-mail for registration. Follow the instructions and you will enter your personal login area. How secure is shopping on SHOEPASSION.com? We use the secure 128-Bit-SSL-encryption standard for all orders to protect your personal data from third parties. It encrypts the personal data you provide us to ensure it is safe and ensures you a worry-free shopping experience. If you have forgotten your password, just click on the button “forgot password?”, right underneath the “Login” button. Enter your e-mail address and a message will be sent to you with a link embedded to reset your password. Otherwise, you can also send us an e-mail at service@shoepassion.com. Which payments methods can I use on SHOEPASSION.com? We offer you several payment options to choose from. You can pay by credit card (we accept Visa or Mastercard) or PayPal. When returning goods, the amount will be credited directly back to your bank account. We charge you 30 USD shipping costs for each order less than 149 USD. All the orders with a value of 149 USD or more apply for a free delivery. My new shoes do not fit. Can I return them? Do your new shoes not fit properly? No problem. We offer a 30 day-exchange policy and will reimburse you the full purchase price if you wish to return the item(s) you have purchased. All returns are free for U.S. customers if the total value of item(s) being returned is more than 40.00 USD and our return label has been attached to the return package. If the total value of the item(s) being returned is 40.00 USD or less, you will have to pay the return shipping costs. To receive a return label, please e-mail us at service@shoepassion.com and indicate the item(s) that you would like to return. We will send the return label to you by e-mail. If you would like to make an exchange, we will send you the new item at no additional charge. To exchange a product, simply indicate the new product you would like to receive on the return form that you received along with the item you would like to exchange. If you send your return 'carriage forward' or as a prepaid package and fail to attach our return label to the return package, you will be billed for the return shipping costs. For further information, see My Returns. Customers from all other countries must bear the cost of the return. If you would like to make an exchange, the new item will be sent to you for free. Why I am not getting a confirmation e-mail? There are two possible reasons. Firstly, you might have entered an incorrect e-mail address. Or secondly, your confirmation e-mail might have ended up in your spam folder. Please check your spam e-mail folder and if you should still have no confirmation e-mail, contact us at service@shoepassion.com. My shipment is damaged. What can I do? How long will it take before I receive my goods? If you place your order before 1 pm on a working day, it is most likely that we will start processing it on the same day. Generally, deliveries take 5 to 12 working days, depending on where you live in the world. Will I be informed, if a pair of shoes is not in stock? While you shop on SHOEPASSION.com, our system will show you if a pair of Goodyear-welted shoes is available. If a product you want is not in stock at the moment, you can reserve one pair for you. As soon as the product is available again, we will send it straight to you. Please e-mail us if you wish to pre-order one of our models. How can I contact SHOEPASSION.com? In case of any further questions and, of course, suggestions, please feel free to contact our customer service department via e-mail at service@shoepassion.com. Our team will be pleased to be at your disposal.